Sady Doyle is outraged, and urgently argues that we should be too! 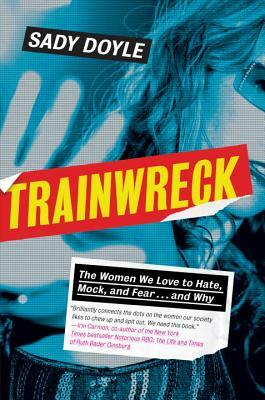 A trainwreck is a woman who spectacularly, publicly, epically fails. Doyle lays out her case that society's trainwreck narrative includes a "bad girl" who ultimately must suffer and endure some type of humiliation, creating a cautionary cultural tale for other women who might be tempted to be too outrageous, too passionate, too... much. Doyle holds up a mirror to show the voyeuristic quality almost everyone has toward women who misbehave. This book is intelligent, provocative, infuriating, and compelling - often at the same time. You'll finish it with a more nuanced way to look at those who have been labeled " a trainwreck." She’s everywhere once you start looking for her: the trainwreck. She’s Britney Spears shaving her head, Whitney Houston saying, “crack is whack,” and Amy Winehouse, dying in front of millions. But the trainwreck is also as old (and as meaningful) as feminism itself. Where did these women come from? What are their crimes? And what does it mean for the rest of us? For an age when any form of self-expression can be the one that ends you, Sady Doyle’s book is as fierce and intelligent as it is funny and compassionate—an essential, timely, feminist anatomy of the female trainwreck. Sady Doyle founded the blog Tiger Beatdown in 2008. Her work has appeared in In These Times, The Guardian, Elle.com, The Atlantic, Slate, Buzzfeed, Rookie, and lots of other places around the Internet. She won the first-ever Women’s Media Center Social Media award by popular vote in 2011 and lives in Brooklyn, New York. Trainwreck is her first book.